Not much to say here about the fire that took place this weekend. The Metropolitan apartments had just recently topped out and is now burnt to a crisp. Nearby buildings including the Quorum Center and The Link apartments suffered damage as well. Above is the view from East Raleigh, about 12 blocks away. See the local news networks for more but it is great to hear that there were no life-threatening injuries. According to historians, this was the largest fire in Raleigh since the 1920's based on response. Quorum Center residents hard hit as sprinklers were on all night. Relief center set up 301 W Jones Street. My hat is off to all of Raleigh/Wake County first responders! Great job! Thank you! Incredible work by first responders. it’s very difficult to control a fire of that magnitude and they managed to do it efficiently and effectively and kept it from spreading. No doubt in my mind our fire fighters are some of the best in the business. BRAVO!, Thank god no one was killed, our first responders are incredible. You know you can count on them in the worst of times. God Bless! OK. So who wants to live in a six story all wood building? Yes, it’s cheaper and steel and concrete. But fires are so dangerous. I wonder if this event will turn a corner in cheapo-wood hi-density buildings? Possibly a little? Virtually Every house is built with wood. Please stop the fearmongering. You have a textbook example of what wood construction does during a fire event next door at The Link. Did the Link burn to the ground? NO. The finished building behaved exactly as it should with sprinklers activated, etc and the building suffered minimal damage. The Metroploitian had no fire safety mechanisms in place yet, on Thursday. Unless you want to pay 3X more with concrete and steel, using your own money, which I’m guessing you don’t, please stop with the “cheap stick built” areguments. You would bring the City’s residential growth to a screeching halt if we tried to require such a building change. @Uncle Jesse, 3X more for concrete and steel construction? Don’t you think that’s a tad bit over-exaggerated? Devon 425 is a concrete structure; are they paying 3X the rent? My condo is concrete and steel stud construction and I couldn’t be happier about that fact. Can I expect to sell it for triple the price? Wood Frame construction can cost up to 40% less and this is why developers like it. They make more money! You ask us to stop the fearmongering. May I ask that we also stop the hyperbole? With everything being equal, I’d think that almost every resident would want to have a concrete structure if given the choice. Certainly Link survived largely intact but that was not just due to the sprinkler system inside the building but the amazing efforts of our firefighters outside of the building to prevent it from going up in flames. Also, Link was damn lucky that scalding hot crane didn’t fall on its roof. I’m not so certain that it would have survived such a tragedy since it would have acted like a match stick. Lastly, now that the sprinklers have gone off and doused Link with water for however long, what do you think has happened to all that wood structure? Will future residents deal with mold and mildew because corners were cut in the re-build or things were innocently missed? @John532 – Nail meet hammer. You are damn right. The argument that The Metropolitan was simply more vulnerable in its early stage of construction and that any building at that stage would be at risk of burning doesn’t really convince me – sure, a majority steel/concrete structure would still be at risk of burning at that stage of construction, but I have serious doubt that it would ignite that quickly let alone burn down that quickly. The Metropolitan was like lighting a box of matches on fire and pouring gasoline on it. @Jake, I’ll add that a concrete and steel building under construction will simply not have enough fuel to burn in the same way that Metropolitan did. 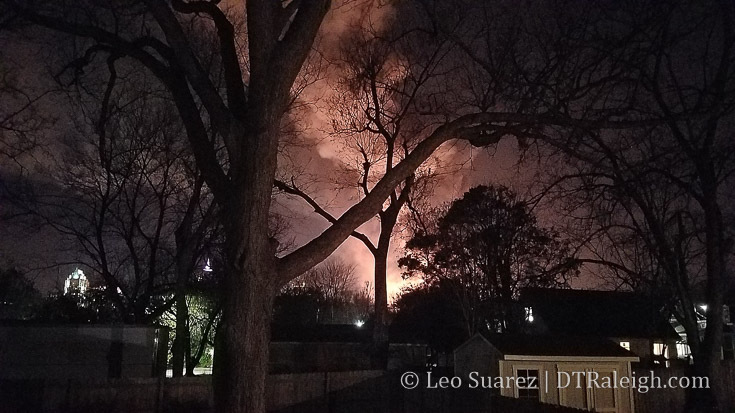 Even with the excellent response of our fire department and the lack of wind to move the fire prevented this inferno from engulfing a much more substantial part of the neighborhood. Had winds pushed the fire to Link, we would have had a much worse situation on our hands. it was just dumb luck that winds were calm. I’d like the code to change to limit multi-family wood construction to 3 stories. This would still allow 3 story urban townhouses. I get that, once the building is complete, the entire assembly is fire rated but I haven’t heard a valid argument or solution about how to prevent this sort of fire to happen again during construction. TBJ has a article today on North Carolina FC ! Just did my usual Monday run downtown and saw all sides of this fire scene. It is unreal the amount and scale of the damage. Having a city block made of kindling for several months is ridiculously dangerous. If we had the winds of earlier last week when the fire broke out, the Quorum Center would’ve come tumbling down and the Link and surrounding buildings would be a total loss. And thankfully the crane only fell where it did, but the wreckage that remained was an incredibly powerful testament to the heat that fire produced. I recall this one in Kingston, Ontario. Same scenario, large wood mid-rise went up in flames during construction. Crane operator was trapped during the fire. @Jeff. The sprinkler system in the Quorum and The Links went off! The links is the same construction as the Metropolitan. The links was exposed to extreme heat and fire and it didn’t burn down. The fire walls and sprinkler systems were NOT installed yet at the Metropolitan. The Quorum will not fall down. Quit watching the news! They love a story. Single family homes (SFD) are almost all made of wood with NO sprinkler systems. Even brick ones are wood with brick exterior. Yes, high winds could have spread embers to more structures and caused roofs to catch fire NO matter if the structure has concrete floors or wood structure. The Metro was 4 floors on top of concrete. Any building considered a high rise are reinforced concrete with 6-8″ fire lines and if higher as Skyhouse they have dual fire lines from two different streets. At building permit time, Fire flow has to be provided to show a minimum of 1500 GPM from the nearest hydrant in the event of a fire. Let’s find out what caused the fire first then changes to building code can be changed if needed. The second Jeff is an impostor! @Jeff, @JRD, That’s my fault. I deleted a duplicate comment by JRD, originally submitted as Jeff. I’ve corrected that so that you guys show as unique. Sorry about that. @BC “Single family homes (SFD) are almost all made of wood with NO sprinkler systems” do we seriously need to explain the (rather large) difference between a single family house -vs- an entire, multi-story apartment complex in a high density, urban area? @BC. First of all, I am not being influenced by what I am reading. I am, however, influenced by what I saw. A half block, 5 floor labyrinth of wood framing is an enormous risk and we saw the outcome of such a risk. Even as horrible as it was, it could have been worse. It could have been a windy evening and that fire could have spread to nearby and further away structures downtown. I am not arguing the effectiveness of life safety assemblies and systems of stick built buildings once they are complete. I KNOW that they won’t burn as fast or as “big” as this tinder box did and that they would be easier for a fire department to manage. I don’t think that we can afford the risk that these buildings pose during construction as the city gets more densely developed. A concrete building at a similar stage of construction could not burn the way that this building did. It’s impossible because there just isn’t enough contiguous fuel to keep it raging. Do we need a Chicago fire sort of event before we make some changes? Do we need hundreds of people to die before we open our eyes to the danger these buildings pose during construction? “Hundreds of people to die” ? Who knows maybe it could have killed millions and spread to Midtown, Crabtree, jumped to Brier Creek, PNC and Durham. Maybe we should install large firewalls every block or so, can never be too safe. Can someone please comment on the status of the Metropolitan site? Has the City given Banner the approval to rebuild?